I'd say she's the cutest girl ever, except that that title already belongs to MY baby! lol! Oh those picutures are priceless! Very sweet. aww! now you got me jealous! I want cute pictures of Ernest! :o) hmm, she looks so healthy, doesn't she have heart problems? Yeah...she's got unfixable heart problems. She can't walk and is really skinny. You can't see very well in any of those pics though. My dad says she's a little blue too from not getting enough oxygen to her body. :( poor baby! 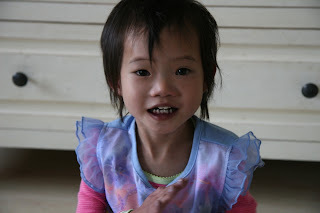 How our God loves orphans! And how precious that He gives us His love for them, too, so that we can care for them, help financially, adopt them, send letters to them, whatever. It's all evidence of God's character. Love that.